Ive tried to build the components but I have is meant for leaded auto-mount parts, not surface mounted parts. I've tried to build the components but I realized it wont work. This is coz the PCB I have is meant for leaded auto-mount parts, not surface mounted parts. So there is no pattern land. Is there any other options possible? That's it all selected circles have been converted to Flashed Pads. Now lets repeat the same process for Rectangles. 3. Once that's done you're ready to build components. Note: Make sure the layer type for the components is either Mask or Paste. I created a video for you below, and forgot to assign the layer types -- I then assigned as Top Mask. Actually you don't even need to create flashes! FAB 3000 is intelligent enough to detect drawn lines, traces, and calculate the pads. 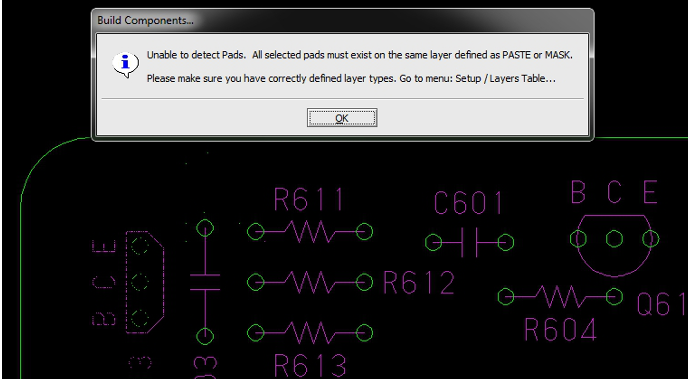 Just make sure you assign the Layer Type as a "Paste" or "Mask" and you can start building components. Note: We did this purposely because some PCB layout tools do not output "Flash" pads in their gerbers. To my knowledge all other CAM tools make you first convert pads to a Flash before building components; FAB 3000 intelligently lets you bypass that step.